The Canon EOS Rebel T3i DSLR Camera W/EF-S 18-135mm f/3.5-5.6 IS Lens gives you all you need to start taking great pictures right out of the box. Charge the included battery pack, put in an SD, SDHC, or SDXC memory card and start shooting! The 18-135mm lens is equivalent to 29-216mm in 35mm format, so you get a wide range, from real wide angle to a true telephoto focal length and high-quality optics. When you're ready to add another lens, it's great to know that the T3i is compatible with all Canon EF and EF-S lenses. The T3i captures beautiful, high resolution JPEG, RAW, and RAW+JPEG images, using an 18MP CMOS (APS-C) sensor and Canon's DIGIC 4 Image Processor. It also records dazzling full HD video at 1920 x 1080 at 30/24/25fps. The wide range of compatible lenses, manual exposure control, and the camera's dedicated live view give you the flexibility you need to create spectacular HD movies. The T3i has a vari-angle 3" Clear View LCD monitor that flips out and is adjustable at a variety of angles for shooting and reviewing your photos and videos, as well as an eye-level viewfinder for more precise composition of shots. Canon's 63-zone dual-layer sensor works with the 9-point AF system for superb, accurate exposures, including low-light situations. The T3i also features an in-camera flash and the option to connect a flash--it's Speedlite-compatible. The 100-6400 ISO rating is expandable up to an amazing 12,800. Using this setting with Canon's Optical Image Stabilizer can produce incredible low light shots. The T3i also features a number of modes that allow you to simplify your shooting experience. Intelligent Auto mode, for example, takes the guesswork out of shooting by automatically setting 5 of the camera's technologies to create the optimum image. Other helpful shooting controls like Basic+ provides the user with 2 options for making creative photos like a pro. The ambience selection adjusts exposure and white balance to give your images a unique look and feel. Box Dimensions (LxWxH) 9.5 x 6.7 x 5.5"
EOS Rebel T3i DSLR Camera W/EF-S 18-135mm f/3.5-5.6 IS Lens is rated 4.7 out of 5 by 320. Rated 5 out of 5 by Anonymous from So far a good camera and lens combo This is a good camera which takes sharp photos in most situations. The full HD movies look great. Movies have initial focus but once started you have to manually focus which adds noise to the movie unless you have an external mike. It has an easy to use auto mode, as well as a program mode, and many other modes most Canon users are familiar with. The autofocus can be a bit slow with some wandering back and forth. Sometimes the flash exposure is a bit overexposed. The 18-135 mm IS lense is very versatile, good but not great as one would expect for such a wide range. I have an old Tamron 24-75 which is sharper. I'd get it again. Rated 5 out of 5 by gs0b from Good all around DSLR and lens The Rebl T3i is a very good, well featured, well built DSLR. It works great as a still camera. Video isn't that great as it can't focus while filming. Max ISO of 12800 is handy in low light situations, however you have to modify a custom function to get it. The built in wireless flash control for Cannon Speedlites is a very handy feature. The 18-135 kit lens is a good all around lens. I take it when I don't want to carry a lot of gear around. It's not too slow (f3.6-5.6). Combined whit the wide ISO range of the body and image stabilization it works well in a wide variety of situations. Overall, a very good camera for all but the most demanding users. Rated 5 out of 5 by Ski Pics from Pro features for best price This is the DSLR you want to buy if you want almost all the features of the very expensive ones, for an affordable price. I work in marketing and take promotional photos with it and have been very happy. I have used this same camera for about a year personally, and just bought another one through my job. After using it for a year, the only con I have found is that the autofocus is very slow when you are using the LCD display to preview. It is very annoying. If you use the viewfinder and turn off the LCD, focusing is fast and accurate. So I only use the LCD to review photos, and have been completely happy. Rated 5 out of 5 by Anonymous from Great camera, great lens! I am a semi-pro photographer and was looking for a great camera/lens kit for a reasonable price... not ready for the higher priced canon cameras yet.. this is fabulous! i am super picky with image quality and after reading some reviews on this site I was skeptical of the lens quality, but I am pleasantly suprised. it is fast, produces sharp images, great range (regaring the zoom). I am going to be photographing mostly children, and this lens gives me the quality and versatility to handle any job. the built in flash is also pretty decent if you underexpose the shot by about 1 full stop. Rated 5 out of 5 by Anders the Philosopher from Powerful Entry Level/Midrange Camera Upon taking a comprehensive photography class that begins from the ground up, I was required to purchase a DSLR camera with little previous camera/lens purchasing experience. Admittedly, several close relatives with a sufficient background in the area directed me towards Canon. There is little variation among the range of competing cameras as far as variety of functions go. However, the bottom line is that, as an amateur photographer, the T3i is an easy to use, stable, quality camera that has every tool needed to get a very customized personal shot. Rated 5 out of 5 by Anonymous from Soooo Nice !!! I'm not a professional nor a novice but the Cannon Rebel EOS 3i with cannon EF-S 18-135mm Lens is really a great camera. It is easy to use with all of its' presets and if you like to get creative it will give you the moon and then some. It only has a small learning curve to take fantastic pictures and I'm looking forward to getting out and shooting-up the world. Taking great pictures is soo easy with the anti shake lens that even in dark or fast moving situations the results are always superb. This purchase has been worth every penney to me. I just love this camera and thanks cannon for a great product. 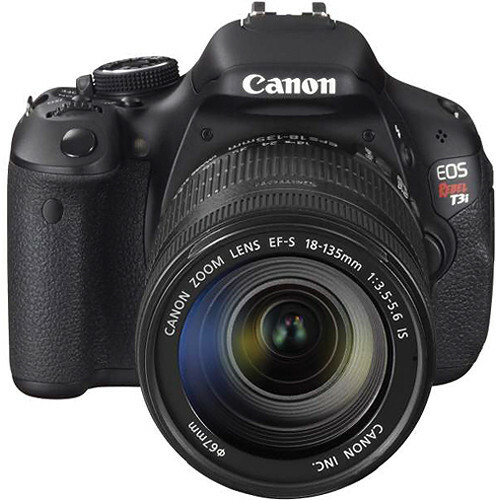 The Canon EOS Rebel T3i DSLR Camera W/EF-S 18-135mm f/3.5-5.6 IS Lens would come with Canons one-year USA warranty, yes. This camera was announced in March of 2011 and started shipping soon after that date.